Dublin in NYC! We love this place. Noel proves that the Irish own the hospitality industry. The food is actually carefully prepared and delicious. Certainly the best chicken pot pie in town. Burgers are perfect. Oysters sparkle and while not inspired by Manhattan, the corned beef sandwich is fave. (It also shows up as a special plate as NY’S finest corned beef and cabbage). Fabulous!!! Cocktails rule and spirits, Beer and wine all are well selected. Wonder of wonders, service is warm and they are even excellent in the takeout department. Check out the menu and pics below and reserve at open table.com. Leopold Bloom, were made legend in the Irish writer’s literary classic, ‘Ulysses’. Bloom’s exploits were to become so renowned, that almost 100 years after his fictional feats were made known to the world, his name lives on, not only in literary circles, but with the establishment of Bloom’s Tavern, an Irish bar/restaurant, on Manhattan’s 58th Street. Bloom, the Dublin-born son of a Hungarian Jew and an Irish Protestant, famously mused in Ulysses how a good puzzle would be to cross Dublin City without passing a single pub. and failing, to solve the conundrum. Bloom’s Tavern, the brainchild of Irish entrepreneurs Noel Donovan, Eugene Wilson and John Mahon, is a lasting tribute to Joyce (one of Ireland’s four winners of the Nobel Prize for Literature), his literary creation Leopold Bloom, and the former’s extensive works. Tastefully decorated throughout with discreet mementoes to the iconic writer’s life and career, Bloom’s Tavern, situated on 58th Street between 2nd and 3rd Avenue, in New York City, is a thriving location, frequented by office workers from the nearby financial, media and technology giants, construction crews from the ongoing building projects in the neighborhood, tourists from all over the world and local residents, who delight in the accents of the staff, the Celtic-fused literary theme throughout, the extensive beer and wine lists and the ever expanding and developing menu (as well as the $1 oysters all day every day of course). one of New York’s few taverns with a working (and welcoming) fireplace. So, if you’re in Dublin, attempt Mr. Bloom’s puzzle, try to cross the city, without passing a single drinking establishment, just don’t try it on Manhattan’s East 58th Street, as it may prove to be quite impossible to avoid the temptation of Bloom’s Tavern. – Michael Fitzpatrick. Consuming raw or undercooked foods may increase your risk of food-borne illness. A known favorite of the late Mr. Joyce. Bailey Irish Cream, Kahlua & Heavy Cream. 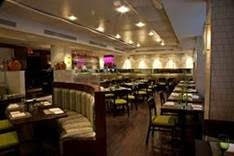 Mozzarella & Vino is located at the former Il Gattopardo space, at 33 west 54th Street. 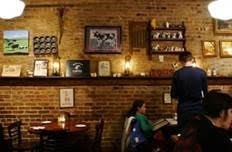 Patrons are very excited with its rustic interior and the amazing ingredients. Chef Vito Gnazzo is responsible for the mouthwatering menu that reflects the simplicity of authentic Italian ingredients, with a heavy emphasis on the Mozzarella di bufala Campana, Italian cheeses and affettati. Based mostly on classic Italian antipasti, such asarancini, panzarotti, and mozzarella rolls, Mozzarella & Vino also serves a wonderful selection ofpanini, soups, salads, and of course mozzarella in all shapes and combinations… even on desserts. The enoteca style bar focuses on showcasing rather smaller family estates and independent Italian winemakers. quality and good value. A variety of by the glass is offered, as well as by the bottle. Their selection greatly varies due to constant new discoveries. This historically based American chophouse set in midcentury New York. It takes great inspiration from history. Both the time the Seagram Building was built and the restaurants that existed at that time. It is the precursor to the NY Steakhouse, when things were still intricate and elegant. 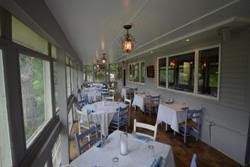 Always a favorite, The Grill-Room (previous name) had lost some of its luster before this stunning renovation. Now with a world class management team and chef, its is again a Manhattan MUST. Brilliantly created by Mario Carbone, Jeff Zalaznick and Rich Torrisi. Celebrating the land, sea, extensive table side preparation and an extensive devotion to grilling. here is a restaurant that pays homage to one’s fantasy of the New York of bygone days and the here and now. Not to be missed. For the menu and official website, click here. Treat Mom to the best of SoHo dining at MAMO Restaurant. This French/Italian Provencal menu from Michelin-starred Executive Chef Massimo Sola hits all the right notes. Mother’s Day Specials include Salmon Carpaccio with Asparagus Salad and Burrata, Risotto Primavera with Diced Vegetables, Roasted Veal Top Round with Wild Leeks and Potatoes, and for dessert Profiteroles with a decadent Chocolate and Rum Sauce. MAMO will also feature a special Mother’s Day cocktail; the delicious Fiore di Miele which is made with St-Germaine, lemon juice, pisco and prosecco. MAMO’s bi-level restaurant includes a casual lounge on the ground floor and a formal dining room upstairs. Both spaces capture the Riviera’s “sense of home” with original family photos and oversized vintage movie posters. The decor also incorporates classic New York-inspired touches such as exposed brick walls. 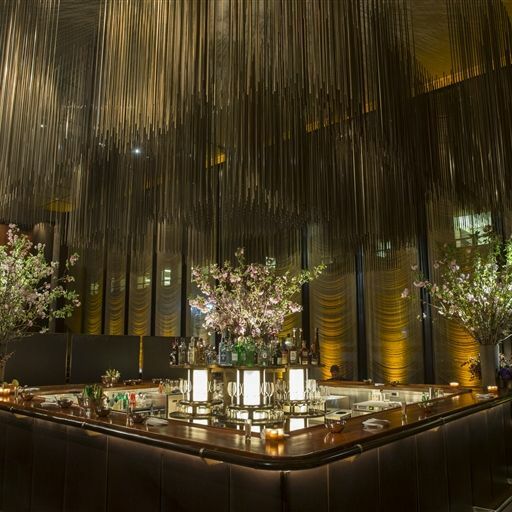 Owner and Executive Chef Philippe Chow puts his own contemporary spin on traditional Beijing-style cuisine at Philippe on Manhattan’s Upper East Side. This elegant Chinese restaurant serves an expertly designed menu of signature dishes such as Chicken Satay, Peking Duck, Green Prawns, and Nine Seasons Spicy Prawns—each presented family style—as well as a too-good-to-resist dessert menu from pastry chef Kostas Paterakis, that includes Red Velvet Cake; the gluten-free Warm, Bittersweet Chocolate Molten Cake; and Peanut Butter Mousse Pie. Specialty drinks ranging from a Lychee Martini toMidnight Mojito, are just the icing on this epicurean cake. This Upper East Side neighborhood gem offers signature dishes from Executive Chef Ben Zwicker’s special menu, which includes a Kale Salad with apple, sesame, and chili-lime vinaigrette; Yellowfin tuna tartare; or the prime aged Angus burger. Also available are the T-Bar Steak Bar—certified Black Angus, filet mignon, aged New York Strip, aged bone-in rib eye, or Black Angus porterhouse for two, served with steak sauce, béarnaise sauce, or poivre sauce. No meal at T-Bar is complete without tasting the popular desserts Banana Parfait Mille Feuilles or Chocolate Sundae with brownie, chocolate sauce, and cream. An artful menu of specialty cocktails—including the exquisite Downtown Manhattan, made with Whistle Pig Straight Rye Whiskey, brandied cherries, Antica vermouth, and cherry herring—and a curated wine list complete this epicurean experience. 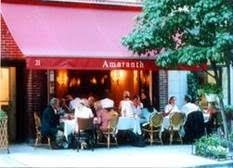 Treat Mom to traditional American home cooking this Mother’s Day at Good Enough to Eat, an Upper West Side dining establishment that has catered to neighborhood regulars, international travelers, and celebrities for over 30 years. Tuck in to Mother’s Day special appetizers such as a Popcorn Coconut Shrimp with Strawberry Sweet and Sour Dip or the Baby Spinach Salad with Roasted Beets, Orange Supremes, Cucumber, Bermuda Onion, Crumbled Goat Cheese and Toasted Almonds, Tossed in a Mustard Vinaigrette. For entrée, Mother’s Day diners can choose from Seared Trout Almondine Served with Spring Vegetable Risotto and Sautéed Asparagus; Inside-Out Chicken Cordon Bleu with Bechamel Sauce Served with Baked Potato and Haricot Verts; or Petite Filet Mignon with Creamy Cognac Sauce Served with Horseradish Mashed Potatoes and Sauteed Broccoli (all served with a side salad). Special desserts on offer to end a special meal include a Strawberry Shortcake and a Chocolate Silk Pie with Fresh Whipped Cream. 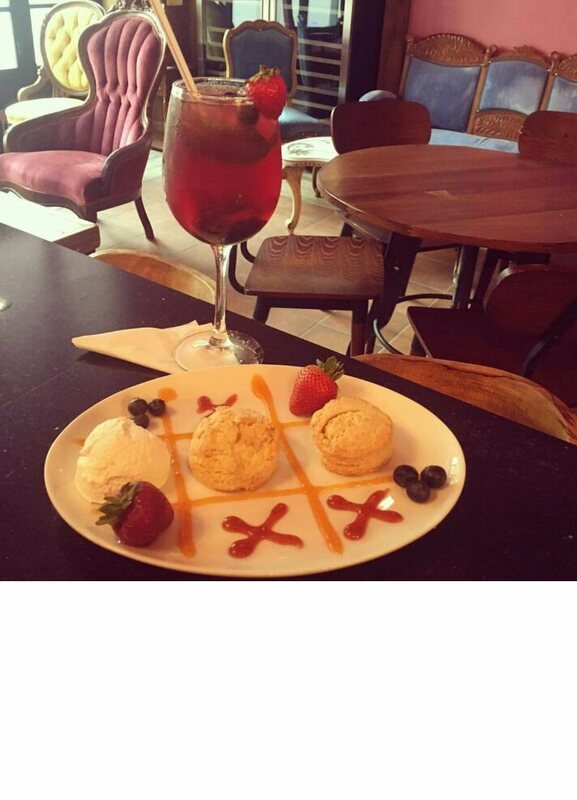 For a livelier Mother’s Day experience, visit popular Ivy Bar & Grill in New York’s thriving Hell’s Kitchen. You will find the wooden tables, burning candles, and decorative lanterns create a warm space to enjoy time spent with friends and family. Specialty dishes that Mom will love include the creamy Kale & Artichoke Dip, the succulent Lamb Burger and the fresh Lobster Mac ‘n’ Cheese. Ivy Bar & Grill is also known for its cocktails, which include the pineapple infused Ivy Martini, the Woodford vanilla bean infused Manhattan Reserve and the Pomegranate White Cosmopolitan. This high end bar & grill regularly offers live entertainment and features a daily happy hour between 4:00 pm – 7:00 pm. Treat Mom to a one-on-one dining experience at this cozy Upper East Side hotspot. Enjoy high-quality Mediterranean dishes that are a fusion of Italian and French classics, including fresh spring dishes such as Lobster Salad with radicchio, watercress, endive, cremini mushrooms and citrus vinaigrette; Baby Artichokes with Avocado and Parmigiano; or Endives with a Roquefort Cheese to start before moving into enticing entrees such as Pan Seared Nantucket Sea Scallops with mushrooms, braised leeks, and lemon white wine sauce; Straccetti di Vitello, super-thin pounded sliced veal served with arugula and shaved Parmigiano; or Spaghetti with pancetta and peas. Save room for the extensive dessert menu that caters to all of Mom’s favorites including Profiteroles; Apple Tarte Tatin; Warm Flourless Chocolate Cake; or Cantucci al Vin Santo, homemade biscotti served with Vin Santo wine for dipping. Each summer, the villages which make up the Hamptons, such as Southampton, Bridgehampton, Amagansett, East Hampton and Montauk to name a few, becomes one of the hottest destinations to visit. Celebrities and socialites escape from New York City to Long Island’s East End to take in the beautiful scenery and enjoy some of the best dining and socializing the area has to offer. From steakhouses to cafés, here are some of the hottest places to dine this Hamptons 2015 season. A hidden Southampton gem, the Southampton Inn’s Café Oso serves its guests and residents quality, traditional breakfast. Executive Chef Peter Ammar is celebrating a decade st at the Inn this year and is particularly well-known for his pancakes, which are served with Vermont maple syrup and Chantilly cream. If you prefer your breakfast cooked in a skillet, Café Oso also serves quality egg dishes including Le Sag Harbor which are two farm eggs scrambled with Nova Scotia smoked salmon, sautéed scallions and cream cheese. Café Oso is open for breakfast, lunch and supper from 7:00 AM- 7:00 PM every day. 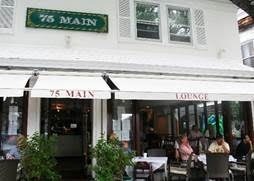 The ultimate place for people watching over brunch, 75 Main, with its South of France feel, has attracted such high-profile clientele as Barbara Walters, Pierce Brosnan, Leonardo DiCaprio, Vice President Joe Biden, and Alex Rodriguez. James Beard Award-winning Executive Chef Mark Militello’s menu, which assisted in its recognition as one of Long Island’s best brunch spots by USA Today, includes creative classics such as The Watermelon Salad with arugula, crumbled feta, chopped pistachios, red onion and passion fruit vinaigrette; Challah French Toast with melon, berries and whipped cream; or the Mark’s Burger with onion tomato jam, bacon, arugula, gruyere, blue cheese and secret sauce. Late night, 75 Main Owner and Host Zach Erdem turns the restaurant into a bustling lounge where some of the world’s best-known DJs play sets until the early hours. Amagansett eatery Sotto Sopra brings Northern Italian dining coupled with a taste of a traditional steakhouse to the Hamptons, inviting guests on a culinary journey that highlights the region’s traditional flavors and cooking methods. Sotto Sopra’s expertly crafted menu developed by new Executive Chef Fermin Jimenez who takes advantage of the restaurant’s wood-burning oven to offer up freshly baked breads, crispy Italian style pizza and whole roasted fish. Deliciously fresh salads, antipastos and impeccably flavored pasta dishes round out the menu along with classic "Bisteccheria" options. Under the direction of Managing Partner Rose Evangelista, Sotto Sopra has quickly become one of the most sought-after restaurants on the East End, known for its frequent celebrity guests, relaxing atmosphere, exceptional service and fresh, flavorful fare. 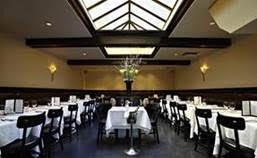 Opened by pianist Bobby Van in 1969, the Bridgehampton location is the original location to establish the great heritage of the Bobby Van’s steakhouse dining experience. The restaurant combines the sophisticated feel of a traditional steakhouse with the airiness of the Hamptons. Guests are able to enjoy signature dishes such as the Harry Salad, named after real estate mogul Harry Helmsley, which includes shrimp, bacon, tomato, string beans, red onion & red pepper; Seared Tunawith edamame, succotash, wakame and miso; or the Porterhouse Steak. Back in the city, the Bobby Van’s steakhouse experience can be savored at five different locations throughout New York including Park Avenue, East 54th Street, West 50th Street, Times Square and at 25 Broad Street. 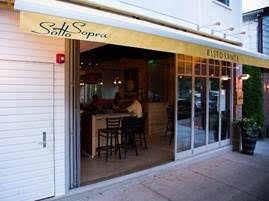 After three years building a loyal following at the original Bridgehampton location for its authentic Sicilian dishes which highlight the specialties of Salina located in the Aeolian Islands, Osteria Salina has moved this season to 108 Wainscott Stone Road in Wainscott, NY adjacent to Georgica Pond. 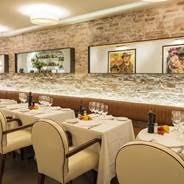 The new Osteria Salina has undergone a thorough refurbishment that has restored the grandeur of this iconic location known formerly as Sapore di Mare. Experience the intimate private dining room, La Saletta as well as the Georgica Room, which boasts views of Georgica Pond. Socialize in the main room against the backdrop of a castle-like fireplace and hand hewn beams. Osteria Salina offers boasts a wood burning pizza oven in addition to a classic baby grand piano bar lounge, and is continuing its tradition of serving fresh, clean local fare coupled with genuine Sicilian hospitality. 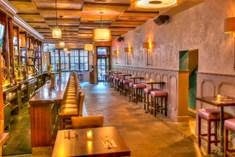 Osteria Salina, helmed by Executive Chef & Owner Cinzia Gaglio and Host Tim Gaglio, can now accommodate private events. Guests will also enjoy live entertainment in the piano lounge, with singer Vanessa Trouble singing Saturday nights throughout the month of July, while dining in one of its many old world dining rooms. Copyright 2015 By Punchin International. All Rights Reserved. 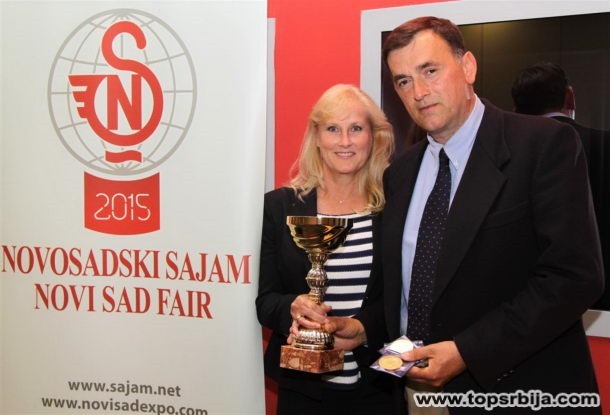 Excitingly, Radevic Estates took top honors at the 6th International Wine Festival INTERFEST, which took place in Serbia earlier this year. 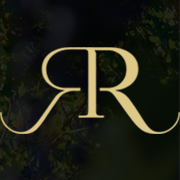 In the United States, Radevic Estates is imported by Omniwines. They can be sampled at the delightful Paul’s On Times Square, 136 West 42nd Street, New York, NY 10036 or purchased in you favorite wine store. Located in the heart of Southampton, the Southampton Inn’s envious location offers guests a gateway to the best the Hamptons summer season has to offer this 2015. With 90 newly renovated guest rooms, on-site dining, outdoor recreation, and connections to all the most popular activities on the East End, the Southampton Inn is the ultimate destination for a weekend getaway or longer vacation stay. At the resort, guests can partake of the Southampton Inn’s acres of lawn space that offers nooks to appeal to many interests. Private gardens are ideal for reading or quiet contemplation, while the all-weather tennis courts, heated 50-foot swimming pool, shuffleboard court, Ping Pong table or green spaces for croquet, volleyball, or badminton will appeal to athletes of all ability levels. For dining options, visitors can enjoy a meal al fresco in one of the new outdoor lounge chairs in the pool area, or unwind over breakfast, lunch or dinner at the award-winning, on-site Café Oso that offers both patio seating as well as indoor dining options. At the end of the day, guests can retire to their well-appointed guestrooms that include Tempur-Pedic mattresses, upscale linens, Gilchrist & Soames toiletries, complimentary Wi-Fi internet access, and flat-screen televisions with more than 100 channels, to rest up and prepare to experience new adventures tomorrow. With an on-site, well-stocked game room, the Southampton Inn is welcoming to families and guests of all ages. Pets are also welcome (for an additional fee) in one of the Inn’s 18 specially designated pet-friendly guest rooms. AAA discounts plus mid-week specials make a stay at Southampton Inn both convenient and cost effective. The property’s 6,000 square feet of flexible indoor meeting space, includes a newly renovated conference room and ballroom, on-site restaurant, and proximity to transportation to and from New York City also make the Southampton Inn an ideal location for corporate meetings, retreats and conferences as well as social gatherings. 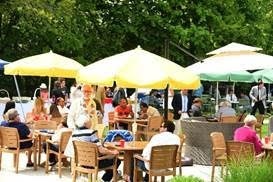 Day passes to the pool and tennis courts are also available for $100 which includes a $20 voucher to the Inn’s on-site Café Oso.